I'm a 15 year old girl (or a chocolate chip) and I <3 object shows! 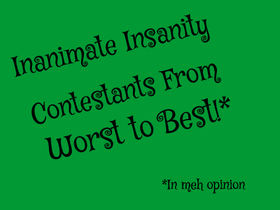 Inanimate Insanity Contestants: Worst to Best! Help get TigerJade's Project Featured! The Official Katie Cadet / MiaFan2010 Fan Club! Sam and Cat Fan Club!!! FEEL LIKE GIVING A SHOUTOUT? DO IT!